Сколько частей Forbidden SIREN вы прошли до конца? Konagihishoka ("Maiden's Secret Song") is the key to the entire story. 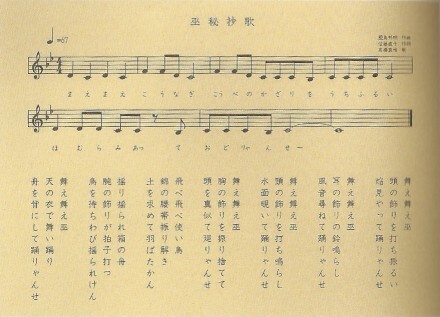 The folk song, which acts as a hint as to the method of opening the seven seals on the seven gates, is actually based on the theme of the Mesopotamian myth of Ishtar's descent to the underworld, and the lyrics were written by Ms. Naoko Sato, in charge of the game's background and scenario. Siren 2 is based on Mesopotamian myth, said to be the oldest myths in the world. Siren 2's director, Mr. Toyama, says that one of the game's themes is "the frightfulness of women who deceive men"; the doves (Kanae, Yuri, etc.) released by Mother are goddesses from Mesopotamian legend, who followed Ishtar ("Ishtar" is Akkadian. In Sumerian she is called "Inanna"), who seduced the hero Gilgamesh. One of the most famous episodes in Mesopotamian legend is Ishtar's descent to the underworld. The folk song "Konagihishoka" can be thought of as a song based on this event. After the unexpected death of her lover, Tammuz, the goddess Ishtar heads for the underworld; along the way, each time she came to one of the seven gates that served as the gateway to the underworld she would cast off an item of clothing or jewellery she was wearing in order to pass through, such as her crown and earrings. At the first gate her crown, at the second her earrings, at the third her necklace... and so forth, each of the items with which she was adorned being snatched away. As you can see by looking at the lyrics of "Konagihishoka", each of the items featured therein matches up with those from the underworld descent exactly, up until the seventh verse. This correlation is continued in the very themes of the actions undertaken to open a path from the real world to the World of Nothingness (breaking the seven seals) and the "underworld descent". Since the descent of a hero (god) to the underworld is a common theme amongst myths all over the world, it can also be seen in the Greek legend of Orpheus and the Japanese myth regarding Izanagi's journey to the underworld. This is a CD containing "Konagihishoka", which was a preorder bonus item for Siren 2's release. Reflecting the development team's efforts to go after a 70s/80s feel, the CD's jacket is designed in the style of an EP record (the so-called "doughnut-style"; the CD itself resembles a record with its upper face painted black). Also, the bonus track, "Happy Birthday", was improvised by Eiji Nakamura, the actor who plays Soji Abe.